High Tech Connections now provides economical plugs, jacks, receptacles, connectors and related electronic components to the OEM market. All are designed and marketed to invite discerning buyers to substitute high cost,” name brands” with economical, first-quality equivalent components. Along with standard products like microphone connectors and receptacles; phone plugs and jacks; DC power plugs and jacks, we can provide a wide variety of RF, wire-to-wire, wire-to-board and board-to board connectors produced in modern manufacturing plants throughout the world. 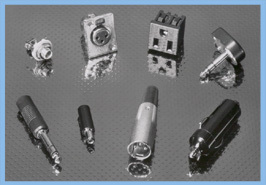 These components are widely used in diverse industries such as audio/video, broadcast, musical instrument, consumer appliance, medical instrumentation, industrial control and computer/data. High Tech Connections pledges unmatched component quality and reliability, always at a significant cost savings over branded products.